On January 2, 2013, our colleague Jay Morris, The Wayward Journey, made my world a brighter place by nominating me for a Sunshine Award. I was delighted. As Jay wrote, some people do not accept awards. In my opinion, one should have a choice in the matter. If you do not accept awards, please look upon my nominating you as a personal tribute to excellent blogs. I should think, you can also tell you have been nominated. In fact, if you know how to do this, I believe you may put the nomination in your sidebar. This is a process I have yet to master. I’ve tried, but made a mess. I am respectful of others, whatever their ethnicity, rich or poor, etc. I had a very loving and generous husband. Nature gave me an insightful mind and good looks. Music, the fine arts, books and cats have brought me great pleasure. I prefer the indoors, but let the outdoors in and the indoors out. My favourite outing is joining dear friends for a dinner, or just coffee, and good conversation. I have been nominated for another award, which means there will be other nominees. I love you all. Congratulations dear Micheline. Your nomination is well deserved! Thank you with all my heart because you nominated my blog. I feel honored! Have a wonderful day, dear Micheline and many blessings! 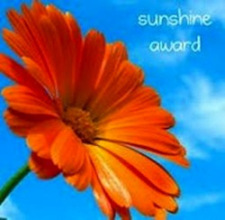 Thank you so much for nominating my blog for a Sunshine Award, Micheline. I’m afraid I don’t have the time to fully comply with all the rules for accepting the award, but I’ve put the nomination in my sidebar as you suggested (together with a link to your blog) and I really appreciate you thinking of me. Keep up the great work!! I realize that you are very busy. You write very good posts. Let this be my way of thanking you. Thank you so much, Micheline! Congratulations on your award! I’ m a little behind at this point. First of all, congratulations on your Sunshine Award, Micheline. And thank you for your nomination. I feel honored, and accept it gratefully. I look forward to exploring your other nominees, and passing on a little sunshine too.